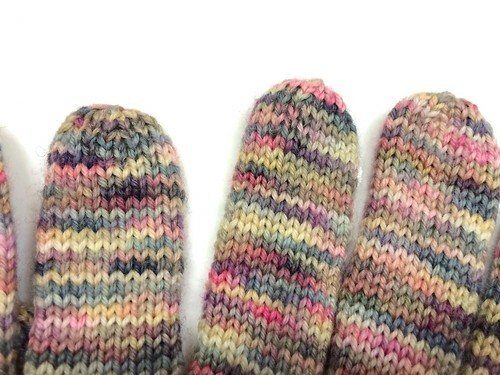 My recently completed gloves are all done and dry. It's very exciting! And something even more exciting, I added in some conductive thread in the index fingertips and thumbs so that I can operate my phone with them. And it works! The thread is really hard to see, too, so the gloves look completely normal. The two fingertips on the left have the thread sewn into them (using duplicate stitch) compared to the right-most fingertip, which has none. You can kind of see the difference - the thread is a dark gray - but it's pretty hard to spot. 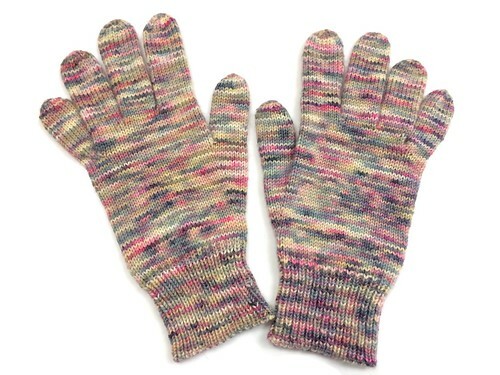 But it works beautifully and makes me want to make more gloves so I can use the conductive thread for them!